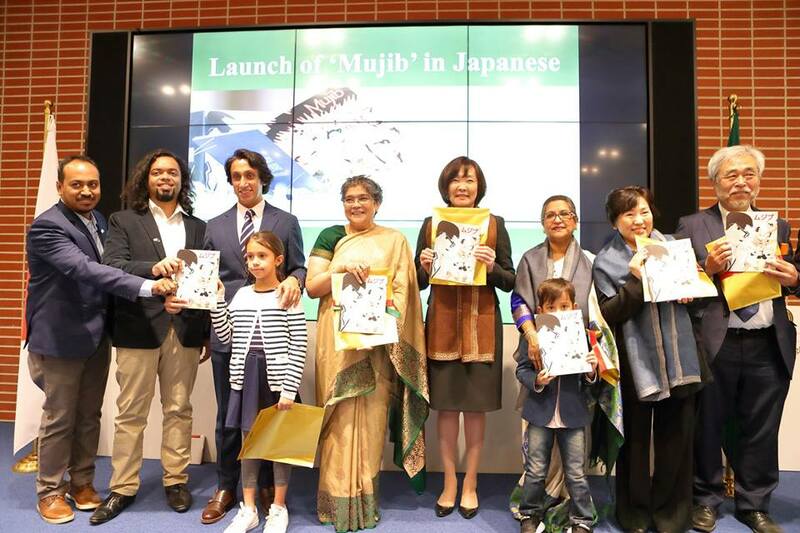 Ms. Akie Abe, spouse of the Japanese Prime Minister, unveiled the cover of the Japanese version of graphic novel ‘Mujib’ together with Ms. Toshiko Abe, State Minister for Foreign Affairs, Sheikh Rehana, daughter of Bangabandhu Sheikh Mujibur Rahman, Mr. Radwan Mujib Siddiq, publisher of ‘Mujib’, and Bangladesh ambassador to Japan Ms. Rabab Fatima in a festive ceremony held on 26th November at the Embassy of Bangladesh, Tokyo. The launch ceremony was also attended by ambassadors, members of the diplomatic community, high officials of the Japanese government, representatives of the business community, members of civil society, media and expatriate Bangladeshis in Japan. In her welcome address, Ambassador Rabab Fatima mentioned that Japanese is the first foreign language after English to which this graphic novel had been translated to, and she hoped that this publication would introduce Bangabandhu to the Japanese children and help them understand his lifelong struggle to achieve freedom for his people. She said, that the publication reflects the deep bond between Bangladesh and Japan, and would contribute to fostering greater cultural exchange between their two peoples. The graphic novel series is, originally a publication by Centre for Research and Information (CRI) which was created by Rashad Imam Tanmoy and edited by Shibu Kumer Shill.